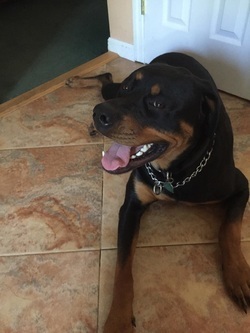 Bear is a 16 month old male neutered Rottweiler. Bear is in need of a home desperately since he has a limited time in his adoptive home. He scheduled to be destroyed by his new owners based on his behavior. The rescue group has decide not to take Bear back regardless of owners plead to return him. Time is on the essence, he will be put down unless he is re-home. We are looking for someone with large dog experience and is very familiar with the breed. Please contact the Blue Point-Bayport Animal Hospital and to speak to Dr. Lani Ramsden at 631-472-1101.